Welcome to Mrhua LED store, we has specialized in researching and developing environmental-friendly and user-friendly LED grow lights over 10 years. 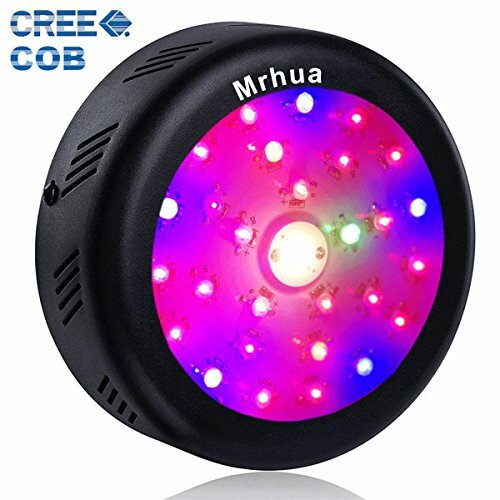 This product using the advanced CREE COB, more popular and more stable in the major forums, can ensure max PAR and intensity with ultra-high lumens, perfect for plants Veg and Flower all stages growth. Zener diode protecting each, one LED out, other LEDs still work, can eliminates the static electricity between chips and plays a protective role. Advanced Full Spectrum: Red(650-660nm, 620-630nm), Orange(600-610nm), Blue(430-440nm, 450-460nm, 460-470nm), UV(380-400nm), IR(740-760nm), White(4000-4500K, 6000-6500K), CREE COB(3000K). [Recommended Lighting Time] Generally 12~18h, day/night on/off as a cycle. [Theoretical Hanging Height] Seedling:28~36", Growing:24~32",Flowering: 20~28". The UV and IR LED chips looks very dim, this is normal. If you have any questions about this product by Mrhua, contact us by completing and submitting the form below. If you are looking for a specif part number, please include it with your message.